Hi there, I have an identical problem on my two early Bally machines. Neither will tilt, even holding the tilt bob or the tilt bob rod against the lower tilt bob "ring". However, it will tilt 100% of the time very easily if I am touching any of the grounded metal surfaces on the cabinet (e.g. side rail, lock down bar etc). i.e. It tilts if I move the tilt bob over with one hand and touch the side rails with the other). Being the genius I am, I thought "this must be a grounding issue" and then ran a jumper from the cabinet ground to the tilt bob, but that caused a small spark and I think a game reset (this was a while ago). I don't know what to make of this. Given I have the same behavior on two games, I thought this might be common enough I could find a fix for this online, but no luck so far. Thank you for reading, and any help will be appreciated! Are these machines that you just got and have always done it, or have they just started doing it? What changed immediately before they started doing it? Power out due to a lightning strike or surge? Move machines? Add a power bar or extension cord? Similar enhancements or bullet proofing to the same circuit board in each machine? What do multimeter voltages look in the circuit? Do you have schematics to know what the voltage levels should be around that circuitry to investigate more? I don't know much about Flash Gordon... is it Bally as well and using some of the same circuit boards. Essentially my question is if they are really acting the same way, and started doing it at the same time, what's common to both machines? Yep Flash Gordon has the same Bally boardset as Paragon except for the later gen sound board. 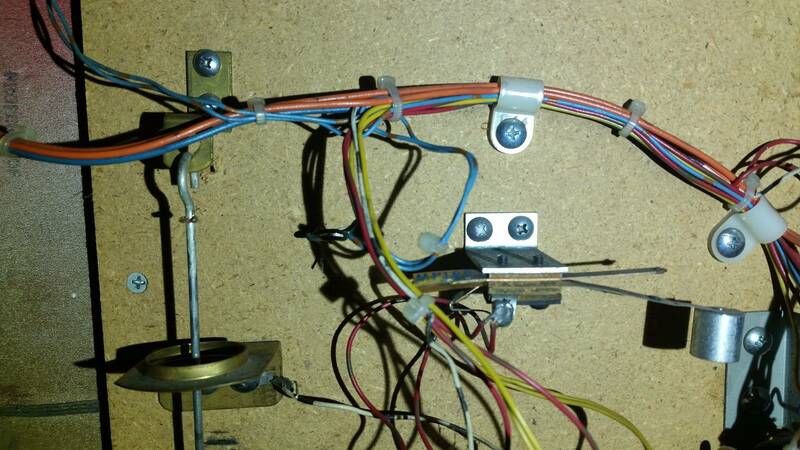 Is the tilt switch under the playfield (usually next to the flipper mechanisms and looks like a slam switch) working ? Have you run through switch test mode to see if any switches are reported as closed (even when balls are removed from the outhole and all drop targets are reset up)? Can you post clear pictures of the tilt boards in the cabinets? Tilt requires ST0-I6. Since it sounds like you can start a game I assume the St0 line is good. I would focus on the 27 wire for I6 that services the tilt. Someone may have cut it or it has a loose connection at the mpu. Thank you for the comments, I will investigate a bit further tonight and see what I can come up with. I have not tested the playfield slam tilt switches. 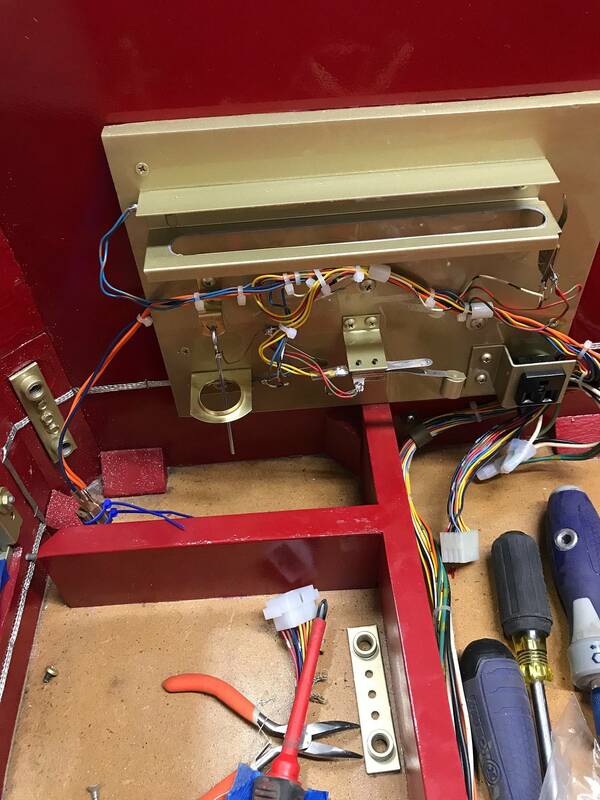 I will also double check to see how many switches remain closed on Flash Gordon (I think at least one switch is supposed to remain closed on that game due to how the single drop works). I have had these games for a while; Paragon for ~8 years and Flash Gordon for ~4 years, but they were both the equivalent of "Barn Finds" and needed a lot of work by me to get them in good playable shape. This tilt issue is really the only issue left to sort out, aside from classic flaky bally bulbs. It is common for this system to register switches by human to ground contact. Don't do it and forget about this as a source of error. The capacitor on the tilt mech might be the bad guy. Try test without. Or else I suspect a disconnection. Replace the switch filter capacitor to correct the sensitivity, if all other switches after testing the matrix are correct. I just fixed a Dolly Parton that had tilt problems. It was the capacitor at the tilt bob causing the trouble. I replaced it with a new capacitor and the problem was cured. Cool. I will give the capacitor a look / replacement. I was not aware of this! Thank you. Hopefully the capacitors sort this out. I will report back maybe tonight! I had the same issue on my paragon. Replaced the capacitor and it worked. I jumpered in a capacitor on both games (both with jumper cables and just winding the capacitor in, but did not solder it in place due to time) on both games. For both games, for all four tests, it did not change. Is the part boxed in yellow supposed to be connected to anything. 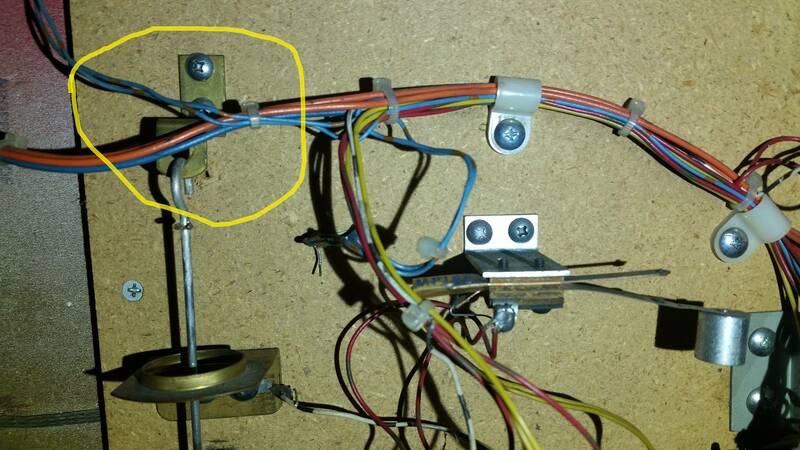 From where the capacitor was wired (line with arrows) it is not clear to me how the tilt circuit even is supposed to work. Both games appeared to be wired the same. I am sure I am missing something basic here. Pictures below are without the capacitor. THAT makes sense. I will wire that up in the next day or two and report back. Thank you very much. Thank you everybody for the help (especially Skins, that picture was worth at least a few hundred words). 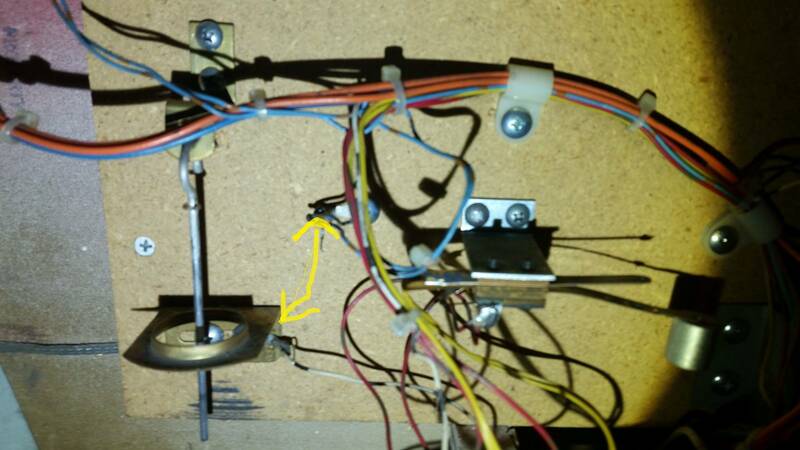 I did a quick test with jumper cables and a cap and this time, with the circuit completed... it worked like a charm.